Build a custom polished concrete desk | DIY projects for everyone! This DIY project will guide you with how to make a polished concrete top embedded with crushed glass ornaments. The desk featured is custom-designed to suit the room it’s placed in. So if you’re planning to make your own polished concrete desk, feel free to change the layout and measurements according to your space. Its features and look should cater to your specific usage requirements and taste! You can use other types of wood and embed a different type of decorative material in your concrete top. The possibilities are endless when designing your own DIY desk! 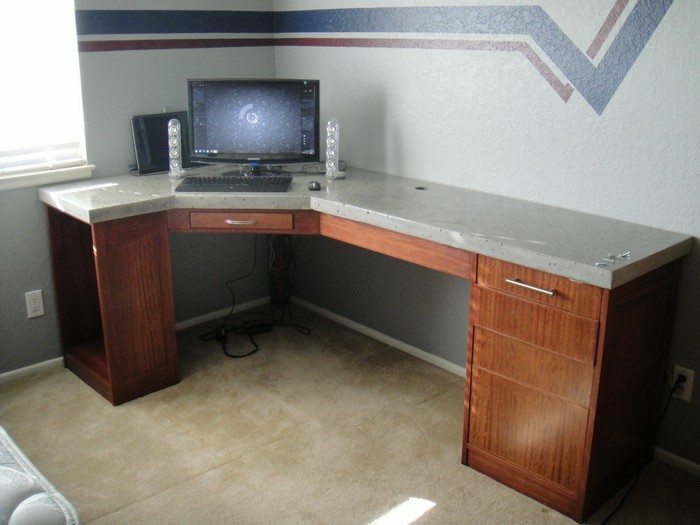 Read on to see how this DIY-er made his custom concrete desk and be inspired to build yours! Does this kind of desk suit your needs? Build the wood desk frame: I am not going to describe in depth this part, partly because I did not take enough pictures and partly because my dad mostly did this part. My desk is constructed of lyptus, which i found out is a genetically modified combination of Eucalyptus and Mahogany. 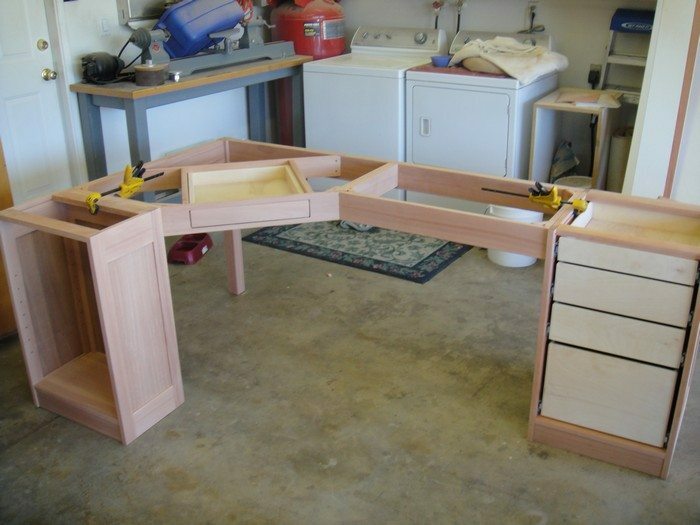 It has two shelf/drawer cabinets ant the ends supporting a center frame with a pencil drawer. The main structural parts of the desk are double thicknesses of solid wood. The cabinets are made of panels holding a piece of plywood to cut down on the amount of solid wood necessary for this project. Build concrete form: For the concrete portion of this project I followed doubleabattery’s excellent concrete counter top tutorial. The form was constructed out of 3/4″ melamine sheet, with sides 2″ high to ensure the concrete is strong enough. measure your desk frame and make the mold accordingly. make sure to test fit your desk before casting the concrete! It is easier to make changes now than later when it is literally set in stone. Use silicone in the corners to radius the edge of the concrete when it comes out of the mold. Add support and embedded objects: Now is the time to add both the wire mesh support (I used K-lath) and any decorative crushed glass or embedded objects you wish to be exposed in the surface of the desk later! Also place any holes you want in the desktop later. Wrap a piece of PVC pipe with some thin foam, then cover with packing tape to make a hole form. The pipe will tap free of the foam, then you can peel the foam/tape away. Use wire to suspend the mesh 1″ above the surface of the form. This will place it exactly in the middle of the concrete. I wanted some crushed glass, so i bought some green, brown and clear glass, as well as uranium glass blobs. Recycled bottles could be a good idea. Any other rocks or other coins or other interesting objects can also work well! The possibilities are endless. I also bought some fiber optic cables to embed into the desk. I drilled some small holes through the melamine, inserted a fiber, then hot glued it on the other side. wire down the fibers and cables before pouring. bring the bundle of fibers together at the other end to go into a light box later. when unmolded and polished they will look like stars in the surface of the desk. Use spray adhesive to hold the glass in place in the mold so they dont get pushed around by the concrete. I would l never dare to do this project my self it would just be scary seeing how it would end up, but It is really amazing all of the great things you have included in this desk (fiber optics, broken glass, concrete top/mold). This is very impressive craftsmanship. I will have to suggest this sort of project to my brother who works in concrete and often has some mold pouring left when he does a job, such a great way to re-purpose his concrete.